How Motiv8 Sport in Chester earned its Local Community Business Heart Award. Stevie Woodrow was recovering from a kidney transplant on Christmas day in 2012. He was keen to return to sport, but there were no established teams he could join that catered for the organ transplant community. He tried to partner with the NHS, but unfortunately there was no funding. Shortly after, Stevie’s Grandfather sadly passed away, so Stevie decided to invest his inheritance in a not-for-profit, fully inclusive community sports business. Stevie was a rugby player before his operation but realised that game was perhaps a little too rough for recuperating players with new kidneys, hearts and lungs so he decided football would be a better sport to kick the business off with. His first step was to get qualified so he completed the FA Coaching course. As a 39-year-old transplant survivor training alongside fit and healthy 25 year olds, Stevie was inspired by how much he was capable of and wanted to pass the positivity on to others in similar circumstances to his. By January 2016 he was ready and Stevie launched Motiv8 Sport to provide community sporting and outdoor activities for mixed-ability children and adults aged three years to 60. He simply wanted all abilities to play, train and learn together in a fully inclusive environment. But this was never going to be a small-scale, low-key organisation, Stevie was aiming high and getting noticed from the very beginning. He approached the British Transplant Games to petition for the inclusion of football in the games. He succeeded and set up a tournament at the games which took place in June. It was a phenomenal success with 200 players participating over the three-day event. Hot on the success of the British Transplant Games Moti8 Sport set up the UK's 1st all Organ Transplant Football Club to be registered with the FA which now plays in the Merseyside Ability Counts league. The team, Liverpool Transplant FC is one of only two such teams worldwide today. But that will not be the case for long if Stevie has anything to do with it as he is using the team as a prototype for the National League Motiv8 Sport is building which will launch this year. Stevie has kept the business and all it does in the public eye with a number of high-profile events. 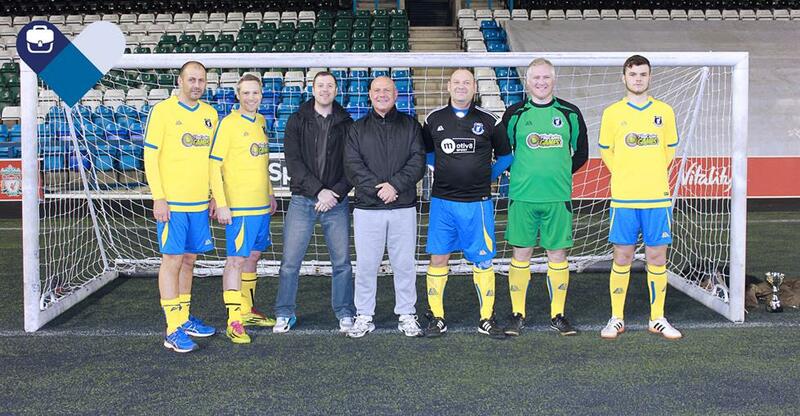 In May 2016 the first Motiv8 Celeb Football Match was held, playing against the Hollyoaks All Stars and raising an impressive £3,000. The game was so successful that in addition to cast members from Hollyoaks, Emmerdale and Coronation Street have hinted at playing next year. And it’s not just transplant patients the business supports. Motiv8 Sport helps low income groups, young carers, vulnerable adults and many others with a whole range of physical, mental and financial challenges. Plus the sports it offers go well beyond the Football Academy and include Outward-Bound adventures, racquet sport, cycling and running. Most recently Motiv8 Sport has partnered with the Outbound Trust to organise its first outbound Adventure for young people with disabilities in the Lake District. "The story of Motiv8 Sport is amazing, to see how transplant surgery can create a business that gives access to sports to so many who would not otherwise be able to participate is fantastic." As well as being a BusinessesForSale.com Small Business Big Heart winner Motiv8 Sport has been nominated for a Pride of Britain Award. We’re keeping our fingers crossed. Has your small business got a big heart like Motiv8 Sport? If so tell us your story by completing our short survey here and watch this space for details of the 2017 BusinessesForSale.com Small Business Big Heart Awards.